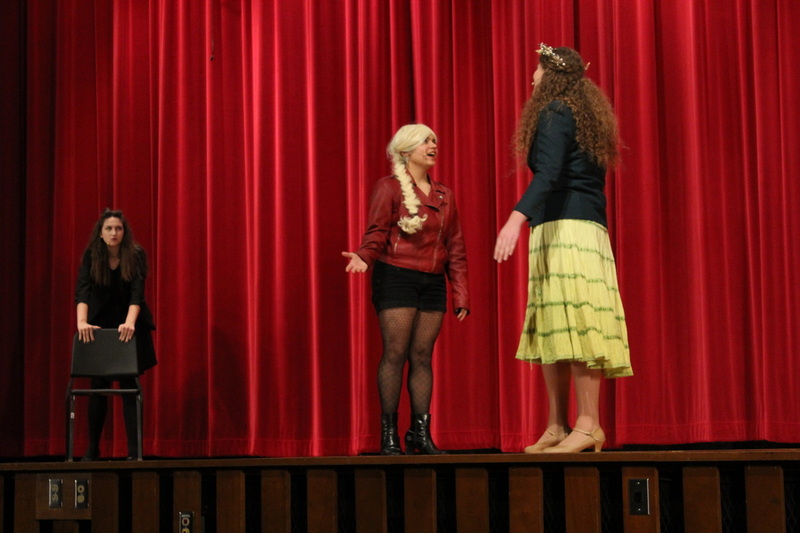 “HELLO DOLLY!” is Reagan’s next fall musical performance, and auditioning can be stressful. Ms. Carrie Baker, a teacher at Reagan, is the theatre director for the musical, “Hello Dolly”. “Most students are nervous for auditions, but you only audition in front of 2-3 other people and you can choose who that is and I've never had someone say they are mad or sad that they chose to audition”, Ms. Baker stated. “We focus on three skills in auditions - students sing a short piece from a song in the show, students perform a short piece of dialogue with another student auditioning, and students learn a short dance from the show and perform for the directors. For lead characters, we are looking for students who can do all three of these relatively well. Most chorus members need to be skilled in two of the three areas,” Ms. Baker said. Andrew Williamson, an eleventh grader, is auditioning as well. “I was in “Joseph and the Amazing Technicolor Dreamcoat” last year, and “Guys and Dolls” my freshman year,” said Andrew. He said that he’s not nervous at all to audition. Anna Rasmussen, another tenth grader is also auditioning for Hello Dolly this year. This is not Anna’s first time auditioning. “I did get other parts. The auditions were a little nerve-racking but the key is to try to have fun with it. When auditioning, don’t say sorry. Be confident, know the material,” Anna advised. “Personally, I was really scared to audition for the musical, but I have made so many friends,” said Anna. Anna shared that auditioning for the musical is beneficial because you can use it on your transcripts for college, and you get experience. Amber Weissert, an eleventh grader, is hoping for a spot in the musical as well. This is Amber’s fourth musical she’s auditioned for. “I was nervous each time, but each time I auditioned, I got less nervous,” she said. Amber does voice lessons, gymnastics, and ballet outside of school, and she does acting in school. “Know your stuff. Memorize your lines. Be prepared. Practice, practice, practice. Know what you’re auditioning for, and do your homework,” she says to people looking to try musical theatre. Amber said that auditioning increases your ability to be courageous, and it encourages you to get out of your shell. You get experience. Sam “Dolly” Locke, is planning to audition as well. “I’ve only ever auditioned for One Acts, and I did get in. I was nervous to audition,” Sam said. He’s also nervous to audition for the musical. 1 choir class, 1 night, infinite memories. Reagan’s very own choir will be putting on an unforgettable show in our school. The choir concert takes place on November 18 from 6:00 p.m. to 8:00 p.m. It will be in the auditorium and have refreshments. “It [choir] brings a certain joy out of me”, pronounced Kyle Radomski, who is in his 2nd year of choir”. Kyle said, “Last year’s [concert] was an amazing time. While, you’re performing you’re so focused on Ms. Breitbarth, you forget to look out into the audience and see their faces in awe”. Drew exclaimed, “It is a really fun and memorable experience. Trust me, this year's [concert] is going to be awesome”. Their pieces include classics like Simon & Garfunkel’s “Bridge over Troubled Water”. They will also be performing a number of pieces not in english. Dakota Timian, who is going to be in her third choir concert said,“The concert is one of my favorite parts of the year. It’s a really fun thing that you don’t want to miss”. She continued by saying, “It is something we have put so much work into and have been preparing for a long time; it’s going to be great”. The choir includes various students from sophomores to seniors. The concert will combine beautiful music and amazing talents to make an extraordinary show. “Choir is something beautiful, it shows what the human voice can do”, said Drew Dickens, a second-year choir student. The captivating students and adults who worked on the One Acts this year passionately put on a show! They all managed to find enough motivation to be an active participant in these plays, and encouraged others to go. Successfully filling in the audience led to a highly ecstatic crowd. All 5 plays had hardworking students, and directors, and of course behind the scenes, the stage crew. The first showing was “Not An Instant” by Anne Liners. This show allowed for the audience to really be an Inquirer. Everyone was left wondering who this mysterious man “Frederick” (played by Kyle Radomski) was, and what his true intentions were. He seemed to know exactly where she’d been all his life. The crowd was also left wondering who these people in black were and why Clarisse (played by Gabriella Schmit) didn’t acknowledge them. But by the end of the play, we all found out what Fred had really been up to in a shocking twist. 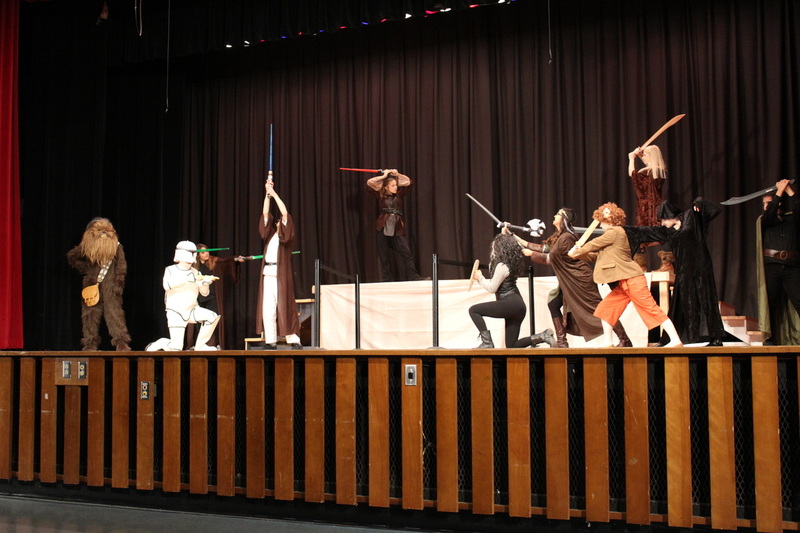 The other One Act chosen to be performed this year was “War of the Nerds” written by Gonzalo Nieto. Just remember, one does not simply write a One Act. These are very time consuming, and it still had everything one nerd could dream of. The audience felt the strong force with this one, and truly related to almost everything in the piece. 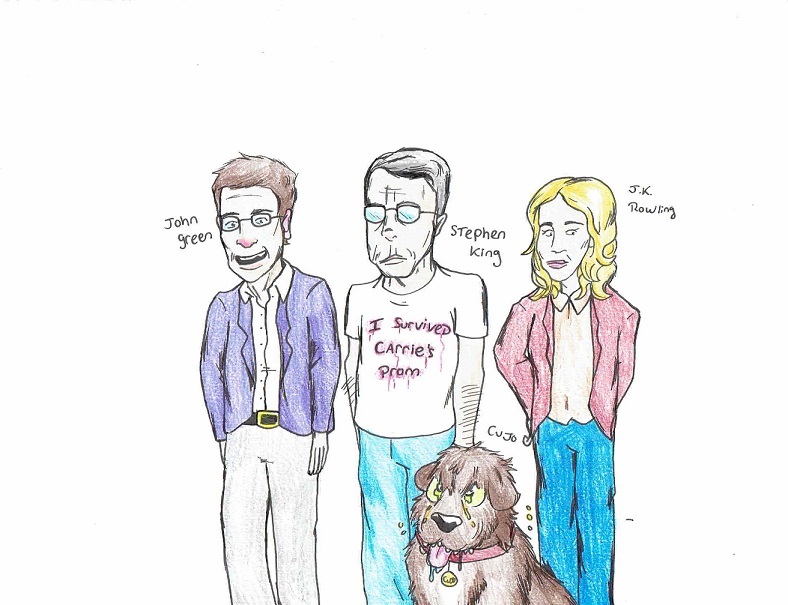 The awkwardness of all the characters, especially George (played by Andrew Williamson) and his love interest the Wookie “Jen” (played by Julia Matiszik). Some might say that Jen was the Obi-Wan for George who was just looking in Alderaan places. This epic tale told of nerds fighting over a convention room. 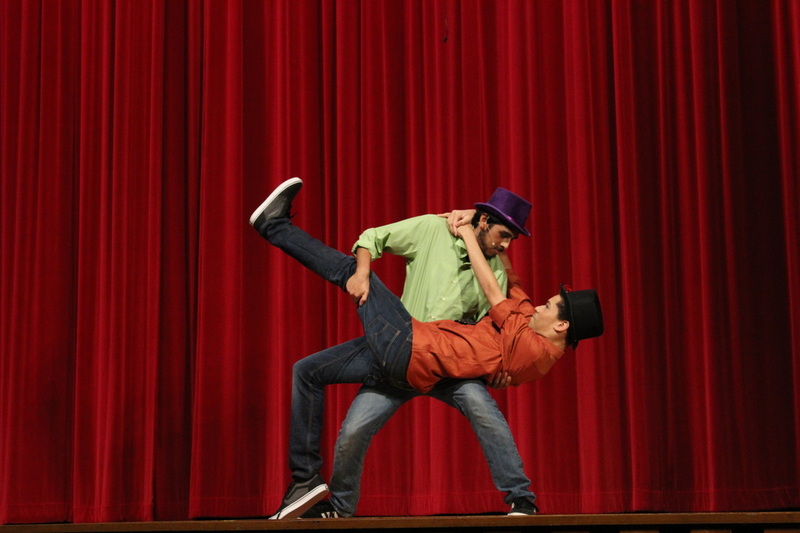 Overall,this piece was clearly well-rehearsed and choreographed and really came together beautifully. The audience erupted with applause like Mount Doom and screamed like the Nazgul. The Senior Collaboration is a fairly new program Reagan is implementing. The Senior Collaboration projects are done by a group of students in the IB theater program, who of course, are seniors. All of the seniors seemed to mutually agree that it was a lot of work, time, and dedication, but the final product was worth it. They began working on it in September, and they felt pressured to finish with a good product. Many students said they had learned something new from the experience. 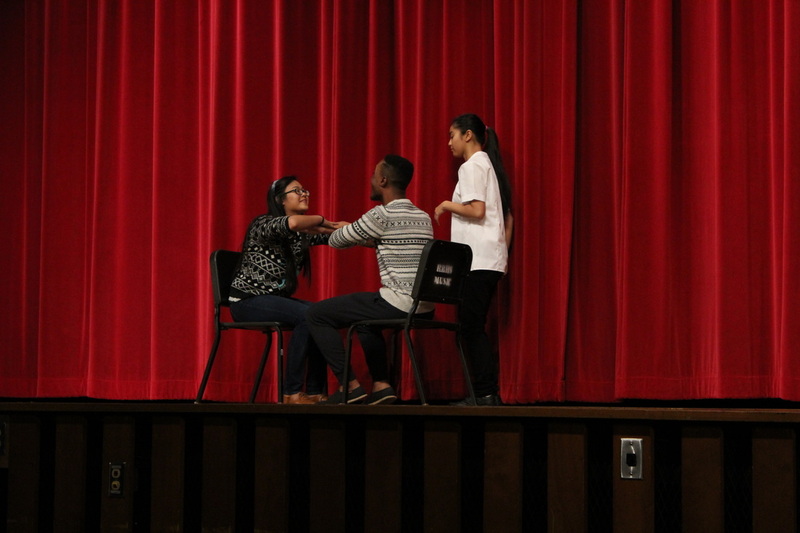 Khemphet Chanthavong said, “I learned a lot about myself and how to control myself… in the end the process is worth it.” This year Ms.Baker told more students about differents kinds of plays other than your typical western theater, which people usually do. These plays tried to do something other than a straight up cliche love story, or just a one act of words. The choreography and the symbolism came out a lot stronger than plays based entirely on dialogue. Using this style, Fefe Jaber’s group worked on a play mostly orientated on actions. Doing this she said,“I’m always in front of people or on the stage, never behind… it made me realize how important stage crew and electronics are because, what would I do without these sound effects in my play?” A lot of the students had never been formally trained on how to even write directions for things like lighting. The first senior collaboration project presented this year was “Hiraeth” by Khemphet Chanthavong, Jesse Lago, Ivy Ward, and Catherine Yamat. This play was based on the love affliction of Khemphet and Jesse. It tells the tale mostly through music and dance, and then through poetry at the end. Ivy Ward wants people to know that “there’s supposed to be no talking.”The no-talking aspect was completely intentional, and they really want people to understand that. This was a wise move for their piece, and it really allowed for them to differentiate from similar love stories. Yes, they have another sad love story, but the way it was told was what made it better. The symbolism of the heart and the brain fighting was a nice visual way to show that Khemphet was struggling with if she should listen to her heart or her mind. The ending with the spoken word piece by Khemphet was yet another powerful message she had to send. ​Jesse said that he wants people to realize “if you don’t know someone’s story, don’t talk about it… we’re all human beings and we’re meant to build each other up, not bring each other down.” This relates to their play since because Khemphet’s character struggles with being bullied in the beginning of the play, and is carrying a lot of emotional baggage. The second senior collaboration was called “In and Out” written by Selena Gaud, Fefe Jaber . 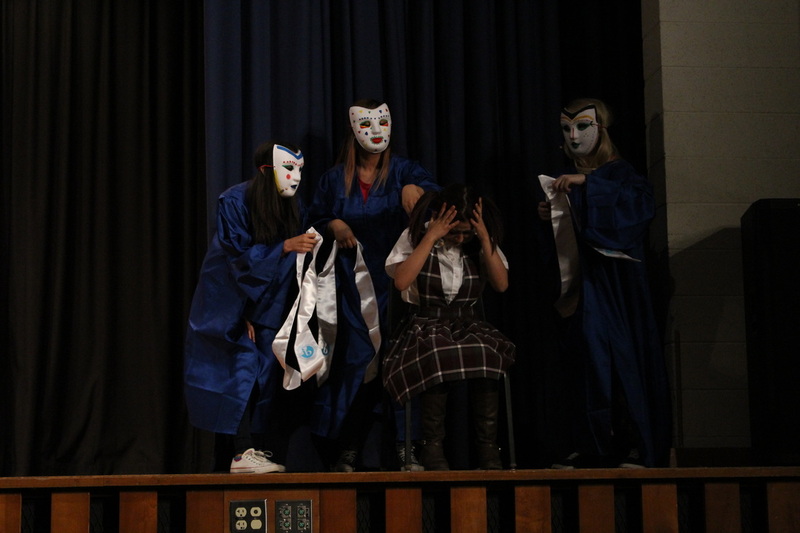 This was yet another relatable play that showed the emotions a student goes through while taking a standardized test. One of the authors, Fefe Jaber, said“An answer of A, B, or C, shouldn’t define who you are.” The message of this play was really just to show that students who are taking these tests shouldn’t feel so pressured by it, even if they are supposed to determine your future, and ultimately who you are. 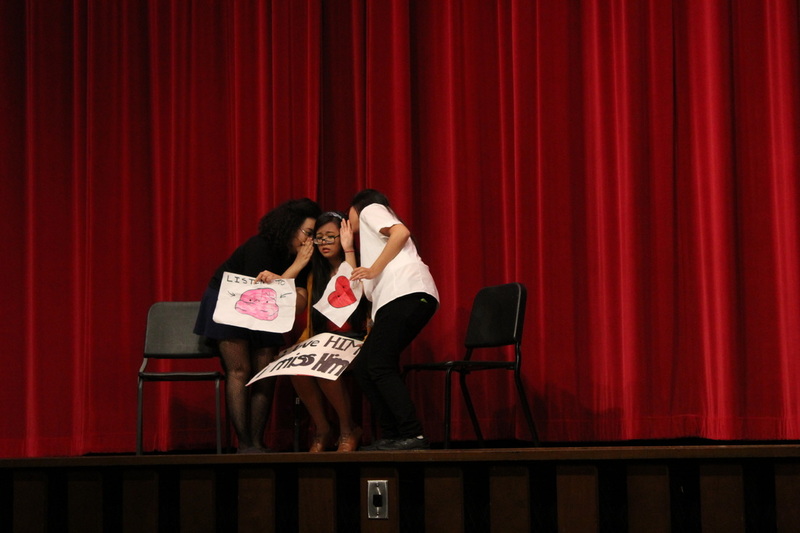 The final One Act was a collaboration written by Kristen Leer, Anne Liners, Gonzalo Nieto, Melody Newton, and Dominic Spencer, titled “It’s Not a Joke”. This play was about a relationship that dealt with domestic abuse. 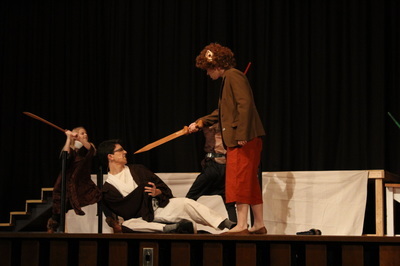 The man doing the abusing (played by Dominic Spencer) had to fight with himself if he should allow himself to follow through with hitting Ellen (played by Kristen Leer) or not. Dominic Spencer explained, “You think of the main girl as crazy because she stays with him, but really it’s not that hard to believe… there’s not a happy ending. She stays with the bad guy so it ends like real life.” This shock into reality brings viewers to question their own morals as well as how they would deal with the situation if it was them. After having had interviewed the authors as well as actors and actresses in the plays, you can imagine one's excitement to see these plays finally done. You can also see where the authors and creators struggled to have people interpret their ideas. Anne Liners stated before the actual showing of the One Acts, “I knew when I agreed to hand the reins to Mr. Puddicombe that I could no longer hope that the play would be my vision exactly, and I'm fine with that.” Everyone should agree that we are impressed with this year's productions, and are excited to see how wonderful the upcoming musical: “Hello Dolly” will be. Briceda Perez said prior to this she’d never been on the stage and that inspired her to want to audition for something else. She said, “I love being part of the One Acts and it feels like a family, and that just really made me want to be a part of the musical.” For those of us who just can’t seem to find the courage to get up on stage, Fefe - who has a lot of experience with theater - said, “You just need to do it a couple times, no matter how big or small the crowd is, it becomes something you’re used to.” If you find fear of public speaking stopping your dreams, don’t let it bring you down. However, none of the shows at Reagan would be complete without the approximately 15 members of Stage Crew. The performers and directors really thank the crew for all of their hard works and making these shows possible. They also get stressed out dealing with managing the lights and sound effects, and also helping out the performers. Chloe Korn said, “People sometimes think it’s a lot to work to stay after school, especially when you’re here every day until 6:30 for the musical. 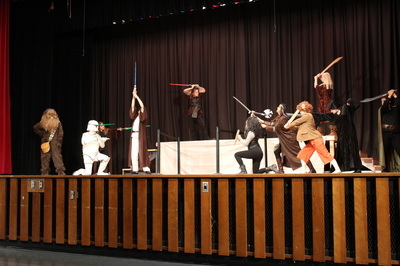 Yes it is, but it’s also really fun.” Even though the One Acts aren’t as intense as the musical, there still is a lot of time and effort that’s put into them. Spider Tales Becoming Decoration: Who Would Have Thought? November is the recognized Native American Heritage month. The United States in a melting pot of many people, religions and cultures that everyone is free to learn, enjoy and research. Native Americans have been well known for respecting the earth, living with nature and foreseeing the life of peace, serenity and dreams coming true. The Native Americans have carried on traditions for years that has been formed into everyday life in the United States. The dreamcatcher, for example has been a recognized symbol, communication device and overall key element in the foundation, preservation and reflection of the beautiful culture that is Native American. The dreamcatcher is a Native American tradition that continues to be one of the most traditional customs in the Native American heritage. The Dreamcatcher has been an American tradition for many years as well. Many shops around the U.S have sold them and continue to be made and have grown widely popular around the world. The dreamcatcher is said to have a structure where the “netting” is allowing only good dreams to pass through and blocking out the bad ones. The origin of the story was a spider in the web, a small child was close to killing the creature when his grandmother “saved” the spider’s life. As a gift, the spider gave her what to be called a Dreamcatcher. No bad dreams will be remembered and will then be tangled up in the web- only letting good dreams pass through. After all, ‘dream catcher’ literally translates to ‘dream snare’, then translating to spider... Dream catchers "filter out" bad dreams. Americans believe that the night air is filled with good and bad and a Dreamcatcher will be able to strain out the bad and keep the good. The hoop symbolizes strength and unity, and is held in the highest esteem. Many other symbols started based around the hoop. There is a bead found in the webbing, after the spider in the web. Overall, the Dreamcatcher it's a symbol, a collection item and a beautiful representation of the Native American culture. 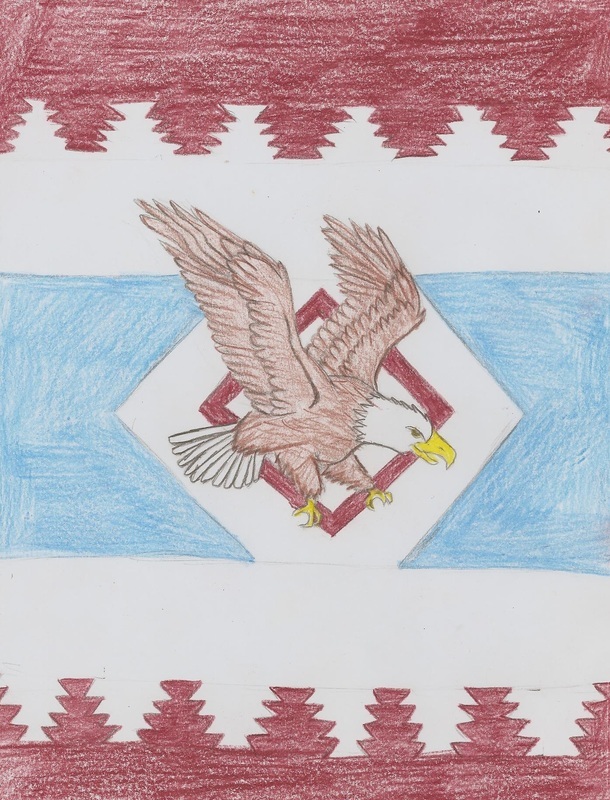 Milwaukee is a part of the large region of Wisconsin that used to be home to the Ho-Chunk tribe and the eagle has long been a symbol of their nation. “My Neighbor Totoro,” is a movie about a fuzzy, giant, hamster(? ), cat(? ), puffball forest spirit that helps kids stay happy through hard times. This movie is way better than you might think after reading that brief description! The story is about two girls and their father who move to the countryside to live near the hospital where their mother is currently being taken care of. They then go into a forest and find a “thing” (a.k.a Totoro) and mysterious events start to happen throughout their time waiting for their mother to get better. Also this is a horrible description of the movie. There's no possible way to get into everything because the movie is a collection of smaller events that surround bigger ones. The characters are the movie essentially. You have the father, Tatsuo Kusakabe, and his two daughters, who are the main stars of the movie. The eldest sister is Satsuki, and the youngest sister is Mei. Then, of course, there's Totoro and little spirit things., There's the mother which at most points is sick in the hospital. There are a few other characters, but you don't see them all that much. All the characters are all reasonably likable but a few of them can be annoying but still retain the good factors that make them a well rounded character. Some characters might be a little bit like mayo, someone might love them while some will be irritated by them. Either way, everyone has likeable traits so you'll find someone you like. This movie will be great during this Thanksgiving break because it’s definitely about family. The interactions between the sisters’ family and the family of forest spirits really shows how they affect each other and their own groups. From maintaining the humans housing to maintaining the forest, the two group help each other with a symbiosis that builds on the other. This also gives the family message of working together brings people to their goals and to take care of the environment and it will take care of you. Also it's mostly all happy and joyful allowing for a carefree kind of feel that anyone can get into. The art is fantastic, and all together looks pretty good allowing for everyone to enjoy just by the pure visuals. This is a great movie I'm sure many people will enjoy, alone or with family. The art is great and the English dubbing from the original Japanese is pretty well done. There is one spot that will weird people out though (not in a good way) where the father and the two daughters are all taking a bath together. This may be normal in Japan, but is the one thing that is strange to some westerners. Other than that, it's a pretty good movie. So watch “My Neighbor Totoro” during this Thanksgiving. Floats and FLurries and Bands. Oh my! Milwaukee’s Annual Holiday Parade has been a tradition since 1927. Featuring costumed characters, balloons, floats, marching bands, live animals and more, the Holiday Parade is a fun celebration for the whole family! Anyone who plans to attend, along with their friends and family, will have a blast watching the silly characters and balloons, and they would also be supporting Ronald Reagan’s band! That’s correct, Ronald Reagan’s band is performing in this joyous event! The band has been working hard, and will continue to do so for their big performance. Freshman Desiree’ Aldi is a first-time instrument player in Reagan’s band. Player of the trombone since the beginning of this school year, she is very excited to be performing in the parade. “It’s something I’ve never done before, and I like trying new things. So I wanted to do it,” said Desiree’. Desiree’ feels that the band is going to perform very well because they have been very well prepared. This will be a new experience for her, and she is thrilled. Are you interested in seeing Desiree’ and the rest of the band in a public event? Gather up a few friends and head downtown on Kilbourn Ave. and Astor St. where the parade begins on Saturday, November 21! The parade will begin at 9:30 am on Kilbourn Ave. and Astor St., head west towards the Old World 3rd St., turn left and continue onto Wisconsin Ave., and will end in front of the The Shops of Grand Avenue on the corner of Wisconsin Ave. and 3rd St. So pull up a chair, grab your coziest blankets, and head on down to the Milwaukee Holiday Parade on November 21! The short story “Empty” written by K. M. Walton, shows readers what life is like through a girl’s point of view. She’s battling her parents’ divorce, depression and losing her closest friends. Dell is 286 pounds and in high school. She is battling a divorce. Dell falls into depression because, despite being very close to her father, they lose contact. Since her parents have gotten the divorce, Dell has put on a lot of weight, finding that eating is her only escape from the real world. Since Dell put on this weight, she and her best friend, Cara, have grown apart. Cara being skinny, pretty and popular, she fits in with everyone at school. Brandon, Dell’s crush since sixth grade, finds one aspect of Dell amusing: her mooing. This is where she squats like a sumo wrestler, stomps around and moos like a cow, which makes Brandon burst into laughter each time. But one night with Brandon changed how she thought of him; she was raped. But she didn’t tell anyone, instead she held it all inside like she did with everything. But someone finds out and tells the whole school. After that, Dell got bullied not only because of her weight but also because people think she raped Brandon. But Dell can’t hold it in anymore. She lets go, thinking no one will miss her, but do they? The book is a brilliant novel, and it shows what it’s like for the person being bullied through their eyes. To the reader, it shows the pain that Dell is going through, how she feels about her parents’ divorce and her weight. The book proves to be a great book and easy read. The Hobbit: Hobbit, Bilbo Baggins is invited by wizard, Gandalf, to accompany him on an incredible journey. Throughout they face a many problems and experience a journey so great it can only be told from those who lived it. East of Eden: In the late nineteenth century, a man named Samuel Hamilton settles in the Salinas Valley in northern California. He brings his strict but loving wife, Liza, with him from Ireland. Although Samuel is well respected in the community, he never becomes a wealthy man. The Hamiltons go on to have nine children and become a prominent family in the valley. The Maltese Falcon: Detective Sam Spade gets more than he bargained for when he takes a case brought to him by a beautiful but secretive woman. As soon as Miss Wonderly shows up, trouble follows as Sam's partner is murdered and Sam is accosted by a man demanding he locate a valuable statuette. Sam, entangled in a dangerous web of crime and intrigue, soon realizes he must find the one thing they all seem to want: the bejeweled Maltese falcon. Lord of the Flies: In the midst of a raging war, a plane evacuating a group of schoolboys from Britain is shot down over a deserted tropical island. Two of the boys, Ralph and Piggy, discover a conch shell on the beach, and Piggy realizes it could be used as a horn to summon the other boys. Once assembled, the boys set about electing a leader and devising a way to be rescued. The journey of survival thus begins for the boys. 1984: In a dystopian society, the government has a surveillance on everything and you’re unable to think for yourself. So when Winston Smith decides to Challenges the tyrant ‘Big Brother’ things take a turn for the worst. The Great Gatsby: When Nick travels to New York in the 1920s in the search of the American Dream, he runs into billionaire Jay Gatsby. The story tells a tale of heartbreak, desire, greed and most of all, the American Dream. Atlas Shrugged: Who is John Galt? In an unspecified time in the United States, the country is crumbling point with Dangy trying to fix them. Dangy ends up going through a philosophical, yet hard journey. 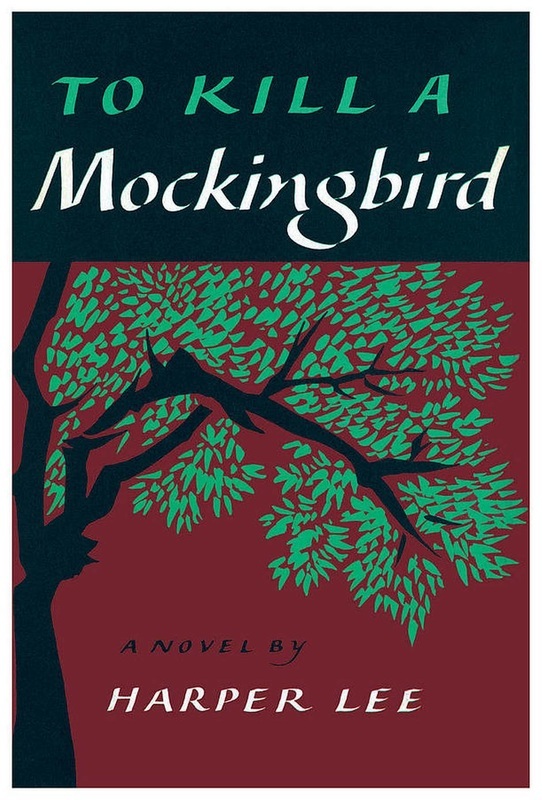 To Kill a Mockingbird: One of two books written by Harper Lee, this story is told through the eyes of Scout; the daughter of lawyer Atticus Finch. During the Great Depression, Atticus is set to defend a black man, something shunned by the world. This story tells a tale of acceptance and ethics. Ulysses: Following the same methods as the Odyssey, this story set in Dublin Ireland and it’s an eighteen episode novel. Each hour is a new episode, similar to the way that Homer wrote the Odyssey, Despite the very complicated plot and old-school language, this is considered one of the best stories of all time. Julio: I’ll start again I guess. First and foremost - I enjoy Tolkien. However “The Hobbit” is was too high on your list. To say it’s the best is absurd. 20% of the novel is unnecessary singing, while the rest of the book is really good, but not good enough to out-rank the likes of “The Great Gatsby” or even “1984”. Might as well throw “The Silmarillion” on here if you put “The Hobbit” as number one. East of Eden is too biblical for anyone to enjoy. “The Maltese Falcon”, well,that will always be overlooked by the film. I can’t bash “Lord of the Flies” or “To Kill a Mockingbird”, but your first three novels are really iffy. “1984” pleases all audiences. It includes history references, great analytical chapters, and all in all is a great story. Julio: Even if you hate “The Great Gatsby”, “1984”, or “Atlas Shrugged”, those three novels are stronger than your first three novels. In comparison, even though everyone has their own opinions, my novels are recognized as classics. How is “The Great Gatsby” not even considered by you? It’s the roaring twenties in a novel. Not to mention that even the movie couldn’t capture the essence of the story, proving that the only way to capture its beauty was through reading the book. The same with “Atlas Shrugged” - the general perception is that the story can only be told through words. That’s why I feel “The Maltese Falcon” doesn’t deserve the recognition it’s receiving by you, because the movie will always outshine the literature, due to the legacy that the Movie has. Jeven: How do you not consider “The Maltese Falcon”? I mean, it's not like the book inspired the film or anything, right? It's an encapsulation and birth of an entire genre of hard-boiled detective books and entertainment. For that to be underrated because of the film is blasphemous, which is why it garnered third in my list. However, the point in making “East of Eden” my second book is because of how diverse and close it is to what I consider literature. Although it is a retelling of Biblical tales and themes, the stories are still true to an extent in the world we live in now; I believe that is what literature's supposed to do. Show us a world we've never seen before, whether it be real or fake, fictional or factitious. Julio: “East of Eden” is a very interesting choice, and I respect that you chose it, however I think that it doesn’t deserve that much praise. The story doesn’t deserve all the hype it’s getting, or the hype you’re giving it. It’s a very bland story. It’s no where near as diverse as “The Great Gatsby”, or even “To Kill a Mockingbird”. Also, “Atlas Shrugged” is just that much better of a story than what you think. “Lord of the Flies” is really good in a respect, however with dystopian future novels, works like “Atlas Shrugged” is a tad superior to “Lord of the Flies”. I say this because it has way more of a philosophical viewpoint of the world. Also the themes in the story are so well written throughout the book. Not to mention it has the best genre of all time-science fiction! Beyond the point, the book is well written and compared to your list, no story you chose is on the same magnitude of “Atlas Shrugged”. Jeven: I agree with your “Lord of the Flies point”, which why it is fourth on my list. To say that “Atlas Shrugged” is better than “Maltese Falcon”, “East of Eden” and “The Hobbit” is quite ridiculous. It may have a slight edge on “The Maltese Falcon” because of it's subject matter, but not to “East of Eden”. The way “East of Eden” weaves and handles its themes and characters is something that was masterfully done. Meanwhile, all Ayn Rand did was create an interesting world and setting as an outlet for her potential beliefs. While it does tackle real world situations and to touch on the situations on a more personal level, like East of Eden does, is more impactful and makes for a better novel in my opinion. Agree? Disagree? Let us know who won the debate, or who has the better list of the two, feedback is appreciated. Also, let us what we should debate next month!